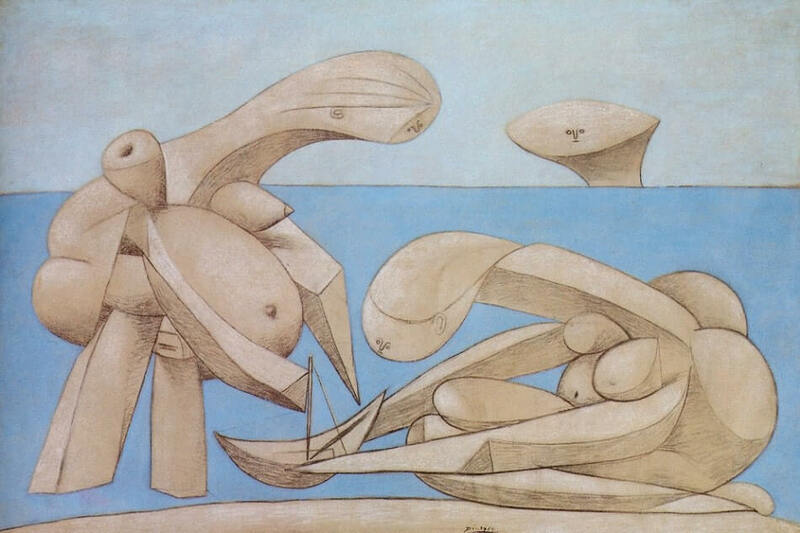 On the Beach (Bothinq) also draws upon aspects of Surrealism, Here we are once more confronted with two female forms constructed from an assemblage of peculiar biomorphic forms. The figures appear to be at the edge of the sea and one lowers a small toy boat into the water. Another, similar form rises above the horizon, as if watching the activity of the foreground figures. However, as this figure is represented as approximately the same scale as the foreground figures, its presence on the horizon implies that it is a gigantic and threatening being. The work is full of narratives incongruities. Why are two grown women playing with a boat? Who - or what - is the form on the horizon, and what is its relationship to the two foreground women? This destabilizing sense of threat and uncertainty recalls similar strategies deployed in the Surrealist paintings of Rene Magritte and Salvador Dali, The anthropomorphic forms also recall the earlier sculptural work of Jeon (Hans) Arp (1887-1966), and resemble the early sculptures of Henry Moore (1898-1986).